The big day is done, huh? As a mom, I can say while it's entirely fun and exciting getting ready for Christmas... it's also beyond exhausting! After weeks (and months) of planning, organizing, baking, scheduling, shopping, wrapping (& hiding), shuttling to Christmas celebrations and activities... after Christmas morning is all wrapped up (or un-wrapped! ), it's then time to get to cooking the huge meal! Nap, anyone?!! Yep, it's a lot of work, but it's well worth it - for sure where the cooking is concerned. I've posted about our Christmas meal before. It's traditional in flavors, and also in many ingredients. Growing up in Newfoundland, my mom's turkey stuffing (we call it 'dressing') is made with breadcrumbs, onion, celery, apple, and the key ingredient - dried savory. My version, "All-Dressed" Squash is in TEV. I use a mix of whole-wheat and white breadcrumbs (all whole-wheat is too grainy, and all white is far too dense for my liking), extra apple, and also dried cranberries. I stuff a winter squash with the dressing (my preference is butternut or kabocha), and any extra dressing I bake on its own in a covered baking dish. Here is one of the squash (pre-baked) just after being 'stuffed' and about to be fully baked. We also have a phyllo dish with our meal, and this year I kept it very simple. I made my Rawesome Nut Dip from ed&bv, and rolled it in a few layers of phyllo much like a strudel. This dip works well in baked dishes, like layered in lasagna, or for ravioli, and so a small amount tucked inside phyllo rounded out the other dishes perfectly, and was especially easy to prepare. And, the other dishes were... Pureed Roasted Sweet Potatoes and Pureed Roasted Rutabaga. The rutabaga (pictured on its own, right) is one of my favorites. Again, growing up my mom always mashed rutabaga (or turnip, in Newfoundland) with butter and cinnamon. She would boil the veggies before mashing them, whereas I roast both the sweet potatoes and rutabaga whole. 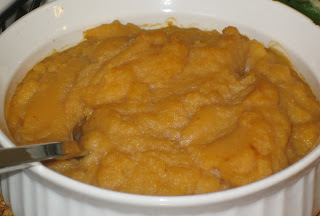 The flavors are more concentrated and the sugars intensify in the vegetables - which is particularly helpful for the rutabaga, which has a natural bitter flavor. I also opt for a touch of olive oil instead of margarine, and season with salt and cinnamon (nutmeg for the sweet potatoes). Both recipes are also in TEV. Normally I also sliced fennel, parsnips, and carrots. This year I didn't, since our family weren't able to join us. So, instead, I roasted sliced fennel and topped it on a mixed greens salad with pomegranate seeds, dressed with a balsamic-maple vinaigrette. You can only partially see the salad in this photo, but it was divine! The combination of bitter greens with the juicy pomegranate seeds, the sweet and sour dressing and caramelized fennel... haven't you roasted sliced fennel yet? It's insanely good! The meal is topped off with Mushroom Gravy from TEV, and Traditional Cranberry Sauce (in above photo) from ed&bv. I made a double batch of the cranberry sauce a couple of days before. It keeps very well, and I'm one of those that takes big spoonfuls of the cranberry sauce... it was especially good with the Rawsome Dip Phyllo Strudel. After plating and eating this meal, I'm always perplexed how someone could find a turkey dinner more appealing than all the colors, flavors, and textures of this meal. I've had many turkey dinners in the past, and the most interesting part of the meal was always the side dishes and gravy. The turkey itself was never that interesting - even when it was considered exceptionally good by all the guests. 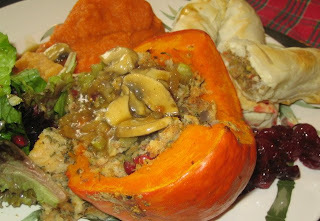 I've had turkey eaters at my Christmas table, and they've loved every bite, surprised at how much more flavor our vegan dishes offer. I know YOU all know that... and believe me, every year when we dig into this meal, we do too! ooh! I can't wait to see the dessert? Isn't it funny how everybody wonders what vegans eat on holidays, yet we spend weeks and months planning our elaborately festive meals? You know they just pick up a precooked turkey and some side dishes from the grocery store. Tsk! I made quite a few of your recipes for my Christmas dinner this year, and they were a big hit! My mom couldn't stop raving about the tamari roasted chickpeas (I knew she would love those! ), my grandma (and the rest) thought the broccoli mushroom phyllo pie was delicious and the truffles... they were devoured! Oh wow, you dishes sound amazing. You are such a genius! What a beautiful and colorful meal! I can't imagine anyone leaving your table unsatisfied! Delicious! WOW Dreena everything looks wonderful. You can cook for me anytime! But all joking aside I would like to take this opportunity to thank you for the wonderful recipes that were part of my holidays. From the awesome cookies, particularly the maple and the chocolate chip to the real highlight, the Festive Chickpea tart recipe you gave out of the Vegan Freaks. Talk about a sum being greater than its parts! It was wonderful. How such common ingredients in such an easy recipe can taste so special is beyond me. But its a recipe that will always be a part of future holiday celebrations. Thank you so much! Looks wonderful! I have definitely gotten more creative since I became vegan. There were so Thanksgivings where I remember the turkey being dry and very forgettable. Wow! This food look amazing! I am jealous! That all looks so amazing. Our tradition is to go out and eat Chinese food on Christmas- cheating I know! This year we didn't make it out, so I had to improvise and it looked nowhere near as good as that. All the food is so colorful and looks like a perfect holiday feast. Happy Holidays, Dreena! What a beautiful spread of food! I agree with you about your turkey comment. I too have always wondered what the big fuss is about the turkey. To me, I have always looked forward to the vegetable side dishes! Thanks you guys for all your comments and feedback on some of my recipes you enjoyed over the holidays - most lovely! :) I always enjoy reading your notes and getting a chuckle out of some of your own stories. Thanks!! !